I've always thought of myself as a responsible pet owner. My animals get their shots. They have yearly checkups. They are all spayed/neutered except for the pony (and no one really spays horses). I worm them, provide flea control, and the horses get their feet trimmed on a regular basis. Granted, I might not put down loads of money on the most expensive, organic pet foods, but my animals are well cared for. So you remember when Natasha got stuck in the wood pile, right? Natasha, our chicken that looks a bit like a hawk, that sleeps in the tree? Well, when she went missing and was stuck in the wood pile, she laid one of her blue eggs. Now she'd been stuck in there for 2 days, and temps had been in the 90s. So I wasn't thrilled with the idea of eating her egg. What did I do? Well, I stuck it under Leghorn (one of our white hens), who was broody. Mistake #1. In all our chicken books, it makes it seem like some drastic miracle has to happen for an egg to be fertilized, under perfect temperatures for 3 weeks, to lead to hatching. So I didn't really think anything would happen. Mistake #2. And this where it gets really bad. The next day, there was another egg under Leghorn. I guess she had taken a break to get some food, and another chicken had hopped in and laid an egg (when hens are brooding, they absorb the yolks and do not lay). I thought, "oh, I'll just leave it there. It'll be company for the other egg". Mistake #3. The next afternoon, I went to go gather eggs, and there was Natasha's blue egg, plus TWO brown eggs. Well, I couldn't tell anymore which brown egg was the older brown egg. Oh dear. I didn't want to eat the wrong one - an older egg. I thought, "Okay, I have to mark these eggs so I can tell which ones are older right away!" So I headed up to the house to get a pencil to mark the eggs. Except somewhere along the way I got distracted and forgot all about it. Mistake #4. Do you see where we're headed here? Yup, the next day there were THREE new eggs under Leghorn, for a total of 6 eggs. And I had no clue (other than the blue egg) which eggs were old and which were fresh. Whew. Right then and there I marked those eggs. So now Leghorn was brooding on 6 eggs. I still didn't think there was any possibility of hatching. But the other day, when I went in to check her, I heard PEEP PEEP. Oh yes I did. That's right, Natasha's egg hatched. We have a new chick. In the fall, which isn't great (simply because of the incoming cold temps). But oh how cute it is. Paul immediately built Leghorn a pen of her own, and we moved the nest. We will leave the other eggs for a few more days to see if any of them hatch as well. I doubt it. 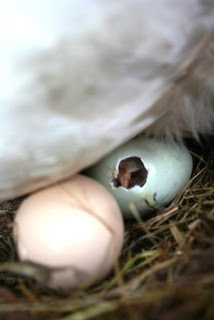 Like I said, it seems like (from the books) it takes some miracle for hatching to occur. In the meantime, despite chilly evenings, Leghorn seems to be providing good care for our newest addition, who does - incidentally - look exactly like Natasha did as a chick. So maybe if we're lucky, we'll have another blue egg layer next spring. I'm linking up with WV Treasures today for Show and Tail. Want to join in the fun animal stories? Click HERE. She's a cutie! Glad she is doing well! Didn't realize it took so much for an egg to actually hatch. Wow. You just taught me a lesson in hatching eggs. And what a cutie indeed! My lil one thinks she's too sweet, too. I hope you get more -- or not -- whichever you want! What are you going to name the new addition? I think it's so cool you name your chickens. I'm glad I'm not the only one that gets distracted when I'm trying to do something construtive.. Just keep the pen in the chicken house and you won't have to go to the house. Maybe that would help.. lol. You have the cool problem but you do get points for this being so cool! An accidental chicken from a blue egg...that's cool! Aw! The new little chick is soooo cute! And mama looks like a good mommy. Congratulations on your accidental chick! lol Great story! Ha ha, the miracle of life! That chick is so adorable! If it's a male you should call it Lil Boy Blue! I guess it was just meant to be! 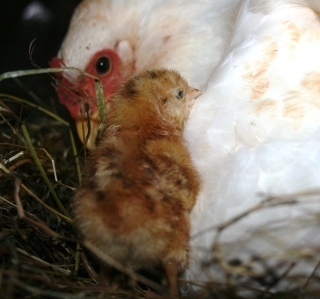 My friend hatches chicks & it really does take A LOT to make it happen. What fun & ohhhh so cute!